This 4-panel map figure outlines our knowledge of the distribution of gray whales in the North Pacific on a seasonal basis. It is under review as part of the IWC’s rangewide assessment of North Pacific gray whales and so may be modified in the future. The Western North Pacific population of gray whales was considered critically endangered when last assessed for the Red List (2008), with numbers estimated at less than 200. There is now evidence of a slow recovery, but the population remains at high risk. The Conservation Management Plan (CMP) for this population was first developed in 2010, in collaboration with the International Union for Conservation of Nature (IUCN). CMPs are flexible and evolving tools, and an update of this one is underway, due for completion in 2017/18. You can read the current draft version here. Collaboration is crucial to the success of any CMP. At the 2014 Commission Meeting, a Memorandum of Cooperation was signed by three of the western gray whale range states: Japan, the Russian Federation and the USA. The Memorandum supports the work and implementation of the CMP and was strengthened in 2016 by the addition of two new range state signatories, the Republic of Korea and Mexico. Industry is also an important collaborator on this CMP. The whales share the waters off Sakhalin Island, Russia, with large-scale offshore oil and gas development projects. The Commission has worked closely with an IUCN Expert Panel and industry, to understand and help minimise the potential impacts of industrial activities in the region. Progress has been made in a number of areas, including publication of guidelines to minimise the impact of seismic surveys on environmentally sensitive areas. You can read more about the IUCN Expert Panel here. One of the first actions called for in the CMP was a collaborative satellite telemetry programme, tagging western gray whales to understand more about their migratory behaviour. Tags applied in 2010 and 2011 showed movement of some animals from the western to eastern Pacific, contradicting the long-held belief that these were two entirely separate populations. Photographic and genetic identification work supported this discovery as, over a period of years, some of the same whales were identified on both sides of the Pacific Ocean. However, it has also been established that not all western gray whales follow a winter migration across to the east. 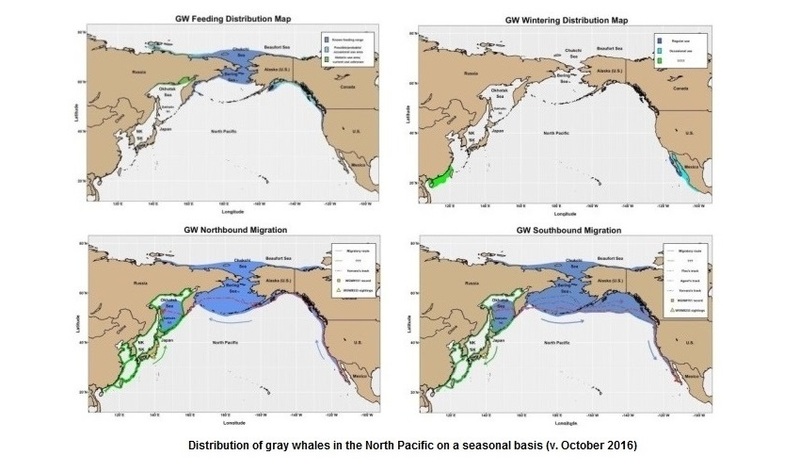 Sightings and acoustic signals have been recorded in Japan and China during the winter and early spring months, indicating that the population structure of gray whales in the western Pacific is complex. In light of this new information, the Scientific Committee of the IWC began a Rangewide Review of North Pacific gray whales in 2014. The review is using computer modelling to test four hypotheses on whale distribution, movements and population structure. This complex work is due to be completed in 2017. Its conclusions will feed into the ongoing update of the Western North Pacific gray whale CMP.